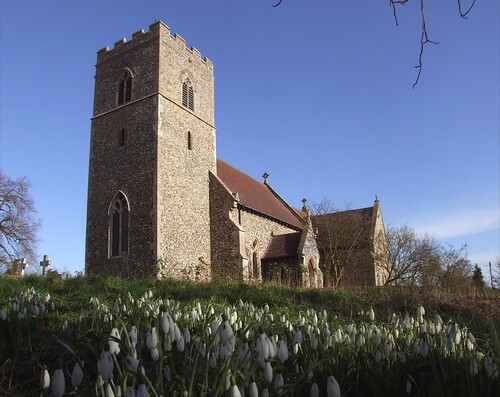 2008: I had last been to Baylham in February 2000, shortly after the Suffolk Churches site had been featured on the BBC television programme Songs of Praise. The resulting interest had kept me rather busy, and so it was a pleasure to escape my computer and head off into the countryside on what I remember as being one of the first beautiful days that year. In 2008, spring had plenty of chance to make its presence felt early, and when I came to Baylham, almost exactly eight years after my previous visit, the sun was shining and the snowdrops were all raising their heads in the achingly lovely graveyard. 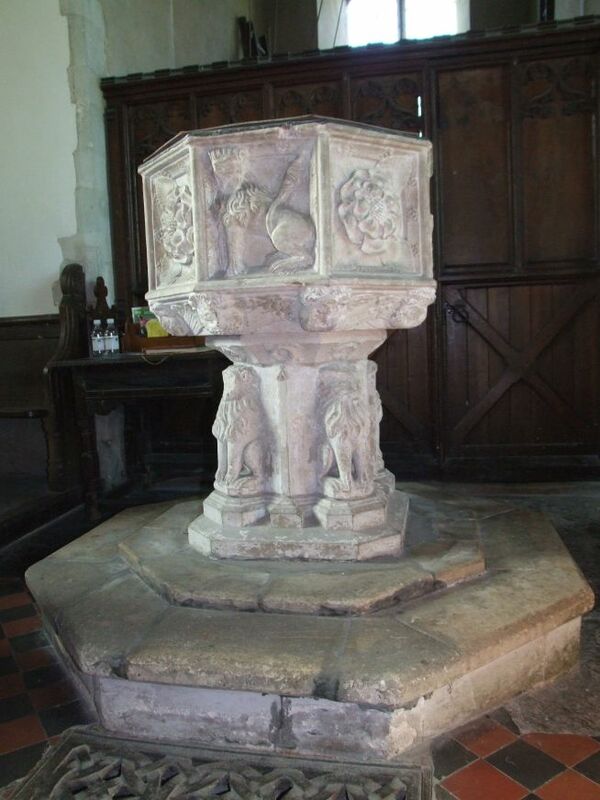 I had been keen to come back to Baylham, because of a conversation I'd had with the churchwarden on my previous visit. I wanted to know, simply, how the parish was getting on. The following is what I had written then. 2000: I have cycled hundreds of miles of the quiet country lanes of Suffolk, so it is always frustrating to be stuck on roads like the B1113 that runs from Ipswich, through the industrial belt of Great Blakenham, through Needham Market and on to Stowmarket. Cars stormed past me, way over the speed limit; perhaps it was the ugliness of the factories, warehouses, quarries and lorry parks that has brutalised them. And yet, not a mile from this awful road, there is a quite different Suffolk. The hills above the Gipping valley on both sides of the river are gentle and wooded, with ancient farms and little cottages. The roads that lead up from the B1113 head nowhere in particular, either petering out in the villages or doglegging back down the hillside. Because of this, villages like Baylham and Darmsden seem remote and lost; villages like Badley barely seem to exist at all. Baylham is the next village after Great Blakenham, and part of the straggling ribbon of development on the road below takes its name. On the north side of the road stood the house where the iconoclast William Dowsing lived, but his puritan theology was moulded at Coddenham church, which was nearer to his home. Dowsing's place may well have been technically within this parish, but for the village of Baylham itself I had to head south, up into the hills. Very quickly, the noise behind me fell away, and the trees encroached on the road. Upper Baylham consists of pleasant cottages and former council houses; nothing too fancy, nothing too posh. The road forks, one leg heading downwards in the direction of Nettlestead, the other climbing up into the centre of the village. A steep drop from this road is more Yorkshire than East Anglia. I pedalled on up, puffing. Just around the bend in the top road, the church came into sight, the 19th century former school beside it, now a house. What it must be to live in that house! There are views across the valley to Shrublands Hall and Coddenham in the hills, and the sounds and sweet smells of an intensely rural churchyard. The valley swallows up the sound of the busy A14, and only trains going through on the London to Norwich line reach the ear up here. 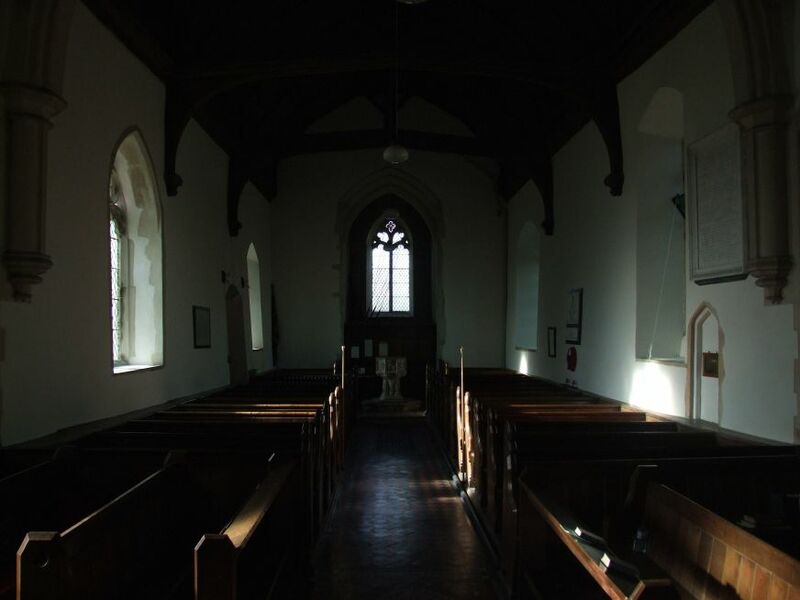 The church is large and cruciform. An enthusiastic Victorian restoration has left it looking rather well. 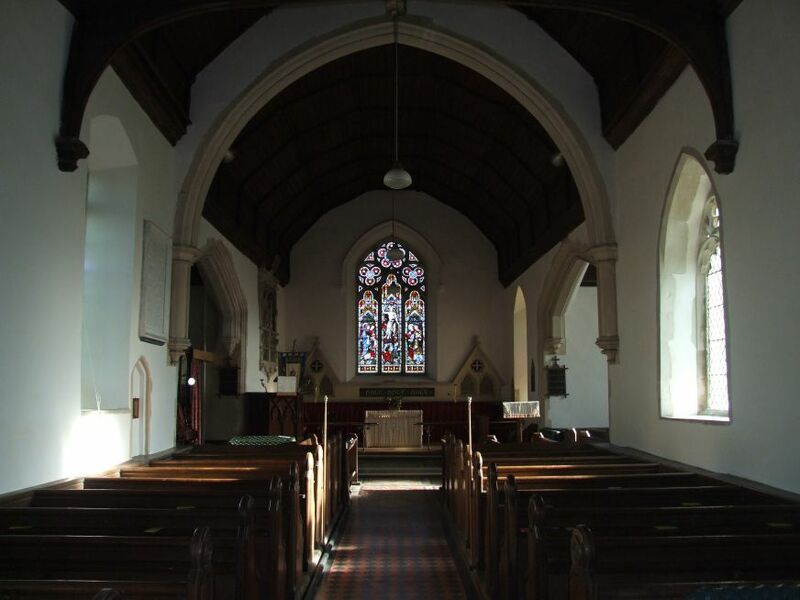 In fact, the rector for 40 years here was William Downes, and he commissioned Frederick Barnes, famous for those beautiful railway stations at Needham Market and Stowmarket on the line below, to largely rebuild this church in a robust style. The south transept bears the Latin for the verse from Genesis: Domus Dei, Porta Caeli (This is the House of God, this is the Gate of Heaven). It contains seating facing the sanctuary. The North Transept contains the organ. The nave, however, is still largely Early English Transitional. The south wall leans out delightfully, and the thick splays of the windows are very attractive. Outside, the Norman former north door is clearly marked. The grand 14th century tower rises over all like a beacon, a sense of strength at the heart of this little community. Downes' memorial plaque is in the chancel. The Victorian porch has a solid external door, and another into the nave. I was pleased to find the church unlocked; shortly after I arrived, a churchwarden followed me in, apparently to put up a notice (surprising how often that happens!). On this occasion, however, I had the pleasure of being recognised ("didn't I see you on television last week?") and was provided with a guided tour. As well as the transepts and chancel, the 19th century work included reseating the church, and furnishing the sanctuary. The Holy Holy Holy of the reredos is similar to Claydon across the valley, and the Victorian tiling of sanctuary and crossing is immaculate. 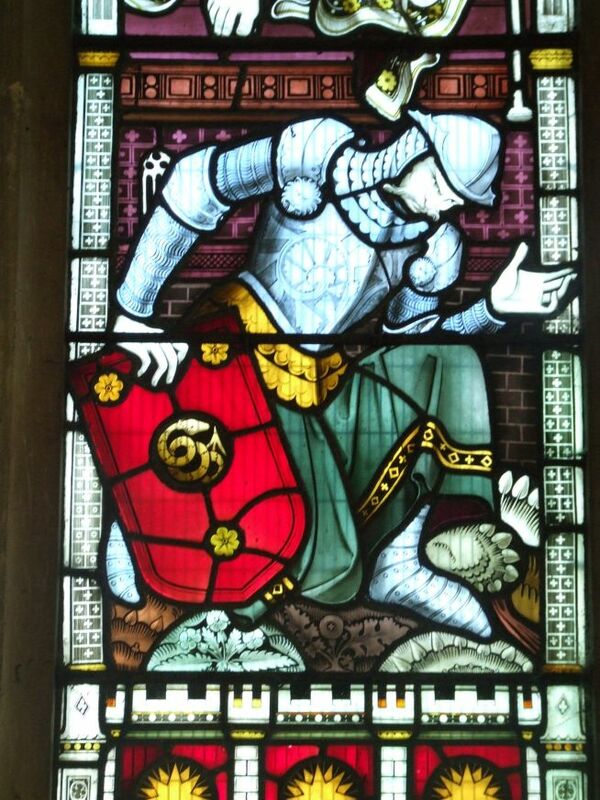 The rather grim 17th century Acton memorial on the north chancel wall has an interesting story attached to it. In the great storm of October 1987, the chancel wall was destabilised, and this memorial needed to be reset. The local builder who carried out the work found that it came apart like a gigantic jigsaw puzzle, and each piece was pegged into the wall with wooden dowelling. It was put back in place using 17th century techniques. Part of the roodscreen has been reused at the base of the tower, perhaps to create a vestry (although this now seems to be in the north transept). The quality of the work here, of all ages, is excellent. There is a great feeling of loving care; here is a parish where people have not lost heart. The bells are currently unsafe to ring, and about £30,000 is needed to replace the bell frame. The nice man who showed me around seemed confident that this could be achieved; this church has a powerful Friends Association, who have raised many thousands of pounds over the last 13 years to maintain it superbly. "It was either that, or close the church", said my guide. The congregation is now less than ten, and mostly over retirement age. They can't maintain it on their own, "but we'll keep going as long as we can", he said. Baylham gave me a lot to think about, as I headed back down the hill. Most churches do not have the resources that Baylham has. But the declining congregation will, inevitably, soon no longer exist. This story will be writ large across all rural areas. What will happen to these churches in the course of the next 30 years? 2008: Coming back, everything I had written was still true. This is a lovely church, beautifully maintained and obviously loved. Heads have not dropped. It is still in the care of a tiny congregation, but the Diocese's well-planned benefice system ensures that it is used almost every Sunday. And yes, I can report that the bells ring out over the parish of Baylham once more.